Prof. Yadav gave the following information related to the upcoming ICT campuses to the audience, most of whom were UDCT alumni. Maharashtra Govt. has offered 203 acres land for ICT Marahthwada, Jalna off-Campus. It was inauguration on May 4, 2018 by the Chief Minister of Maharashtra. This is the first example of Industry supported campus. IIT Kharagpur has joined for Research and Innovation Centre Innovative programmes: Integrated M.Tech. (Trimester, 2 year internship), Executive M. Tech., and Ph D. programmes, involving intense industry interactions, will be offered. All the three campuses, mentioned above, will be Centres of Excellence in Research and Innovation. Prof. Yadav said that ICT was no longer just a Chemical Technology institute. ICT has successfully integrated Chemical Sciences, Engineering and Technology; Product Engineering, Materials Sciences and Engineering, Biological Sciences, Engineering and Technology, Energy Science and Engineering. The Institute is now leading in research in the fields of Green, Nano, Bio technologies. Understanding role of pores, particles and interfaces will help in developing cleaner and greener processes. Use of waste biomass, carbon dioxide, water, air and sunlight will lead to sustainability. Nothing is waste but wealth and a systems engineering approach should be helpful in best use of materials and energy. Earlier, the programme started with the welcome speech by Shri Sanjay Shah, Chairman of the UAA-Ahmedabad Chapter, who briefed the delegates about the history of the Ahmedabad Chapter and also about it’s activities. Shri Sanjay Shah said that the UAA and all of its Chapters in India and abroad were actively engaged in supporting ICT in all its endeavours. The support was made possible through generous financial contributions especially from alumni and from industry. Supporting student welfare activities, including, providing loans, scholarships etc. to needy students. Shri Shah informed that already Rs. 65 lakhs target was achieved. He said that the student welfare activities would also be done by the UAA-Ahmedabad Chapter from part of the funds collected. Prof. Padma Devrajan, President of the UAA, in her speech gave details about the association and its activities. “Our Alumni Association is just 30 years old. We have about 6500 members and nine chapters across the country of which I must put on record that the Ahmedabad is one of the most active chapters we have,” she said bringing cheers to all the members present in the hall. She also informed that UAA had six chapters across the world including two in USA. Prof. Devrajan announced that there was soon going to be a third chapter in the west coast of USA bringing the total overseas number to seven. 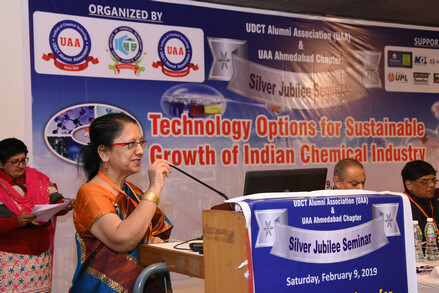 Prof. Devrajan also informed that UAA was spearheading a very important activity at ICT, which is the introduction of short weekend refresher course on Chemical Technology practices. According to her the course curriculum was being finalised by her colleagues and would be ready soon. “Since 2018, we’ve started a student innovation competition where students are asked to submit an idea and make a three minute on-the-spot presentation on their ideas. We are promoting innovation and in view of very encouraging response ICT is working on the idea to set up an Innovation Council,” Prof. Devrajan informed. Prof. Devrajan sought support from alumni for infrastructure development, instituting awards, providing loans to needy students, arranging factory visits etc. She exhorted members to come forward and help in whatever way it suits them. Prof. Devrajan urged members to participate in large numbers in the celebrations to be held in May to commemorate three decades of excellence on the occasion of UAA’s completion of 30 years. 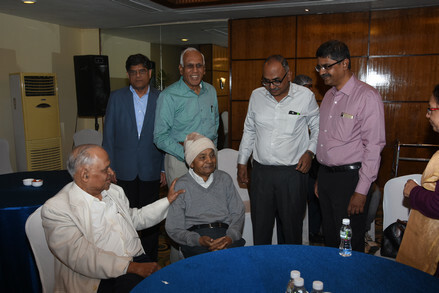 It was a proud moment for all those present in the hall to be in the company of Prof. MM Sharma who needed absolutely no introduction. Listening to him is always a treat and one has to be really lucky to have an opportunity for that treat. 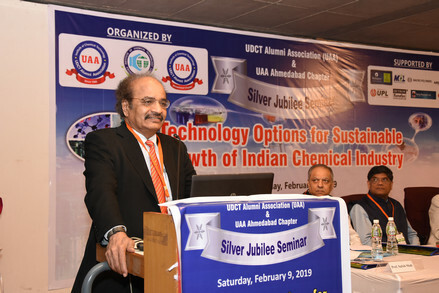 In his Address, Prof. Sharma traced the history of chemical innovation since the early 1850s to current innovations and emphasized utility of chemical industries in daily life. According to him soda ash – bulk of which (90% plus) in the country is made in Gujarat – was the first major innovation in the history of chemical industry. The process developed then solved a major process drawback by replacing a polluting process. Hence, you may say that this was the first example of sustainable process way back in 1865. 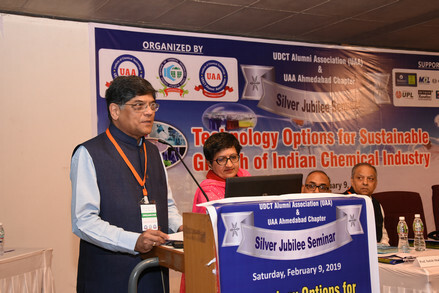 Prof. Sharma talked extensively about milestones in chemical engineering like the development of Solvay process, Leblanc process, the contribution of chemist Wallace Carothers in inventing neoprene and nylon and many other major achievements of chemists. Dramatic innovations have taken place over the last 100 years leading to lower pollution, lower power consumption, lower installation costs and overall lower cost of production. The process development/improvement never ends. No technology is ever mature. So innovation is a continuing process. Soda ash used to be manufactured using salt, limestone, sulphuric acid, and coal in the early 19th century. The process was was far from an ideal solution because of expense of its inputs and its polluting byproducts (including hydrogen chloride gas). The Solvay process or ammonia-soda process is the first example of sustainable process for the production of sodium carbonate (soda ash, Na2CO3). The ammonia-soda process was developed into its modern form by Ernest Solvay in 1865. Gujarat is home to caustic soda also. A number of caustic-chlorine plants. Dramatic innovations have taken place in this area. People have forgotten that Tata Chemicals first used to make caustic soda by causticization of soda ash (causticization of lime which was already present in the soda ash plant). From there we came to diaphragm cells and asbestos became a curse so we moved on to mercury cells. Brilliant! In the mercury cell process, sodium forms an amalgam (a ‘mixture’ of two metals) with the mercury at the cathode. The amalgam reacts with the water in a separate reactor called a decomposer where hydrogen gas and caustic soda solution at 50% are produced. The mercury process used the most electricity, but no steam was required to concentrate the caustic solution. However, the use of mercury demanded measures to prevent environmental contamination. Also, mercury must be removed from the hydrogen gas and caustic soda solution. Reliving old memories: Prof. MM Sharma with his classmate (1958) Shri Shirish M. Parikh, Chairman, Macro Polymers Pvt. Ltd., Ahmedabad. Government Recognized Star Export House, Macro Polymers manufactures Synthetic Resin for Paints, Printing Inks, Wood Coating Lacquers and Adhesive Industries. Shri Shirish M. Parikh started the factory in 1962. Petrochemicals are chemical products made from raw materials of petroleum or other hydrocarbon origin. Although some of the chemical compounds that originate from petroleum may also be derived from coal and natural gas, petroleum is the major source. The largest petrochemical industries are to be found in the USA and Western Europe, though the major growth in new production capacity is in the Middle East and Asia. There is a substantial interregional trade in petrochemicals of all kinds. World production of ethylene is around 110 million tons per year, of propylene 65 million tons, and of aromatic raw materials 70 million tons. Petroleum refineries are marvels of modern engineering. Within them a maze of pipes, distillation columns, and chemical reactors turn crude oil into valuable products. Large refineries cost billions of dollars, employ several thousand workers, operate around the clock, and occupy the same area as several hundred football stadiums. The U.S. has about 300 refineries that can process anywhere between 40 and 400,000 barrels of oil a day. These refineries turn out the gasoline and chemical feedstocks that keep the country running. "Refineries have to move towards making more and more petrochemicals. There are precursors of naphthalene which you can get entirely from petroleum refinery and not from coal tar. A lot of naphthalene is imported in India. Similarly, huge quantities of toluene, styrene, PVC, acetic acid, methanol etc. are imported. All these products can be made in India," said Dr. Sharma. He cited the example of South Africa's largest refinery, Sasol, located at Sandton near Johannesburg. Dr. Sharma predicted that within five years, at least 30% of the total capacity in some of the refineries will be utilized for petrochemicals and within another two years thereafter, it will be 50-60%. Prof. Sharma also foresees renaissance of the Fischer–Tropsch process which is a collection of chemical reactions that converts a mixture of carbon monoxide and hydrogen into liquid hydrocarbons. The current interest in Fischer-Tropsch synthesis has grown up as consequences of environmental demands and changes in fossil energy reserves. 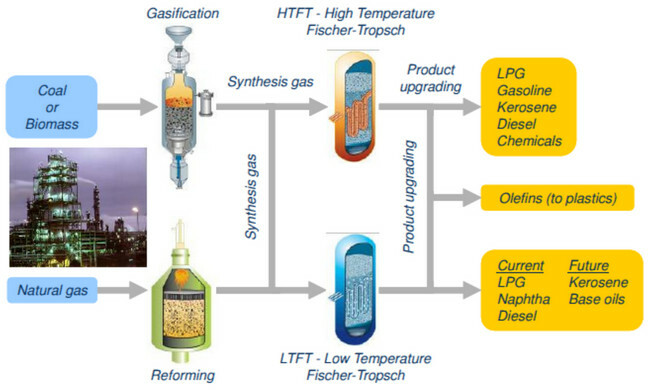 Fischer-Tropsch is a desirable technology producing high quality end product: ultra-clean fuel or major chemical feedstock. Over the coming decade, demand for oil from the transportation sector – which accounts for about 50 per cent of total oil consumption – is set to reduce as a result of electric vehicles, biofuels, strict emission regulations and higher fuel efficiencies. Crude demand will be driven by the chemical sector instead, at a rate of 4 per cent per annum – equivalent to more than half of total oil demand growth – through to 2035. The drivers behind petrochemicals demand, which is expected to more than double over the next 20 years, include population increase, improving living standards and demographic changes, particularly in developing economies in Africa and Asia. The fate of mercury process was sealed due to incidents of mercury poisoning in Minamata and Niigata in 1972. Japan started switching to membrane cells, and today it has no more mercury cells in operation. Japan was the first major chlorine producing country to convert entirely to membrane cell technology. Later, we moved on to an extraordinarily innovative process of membrane cell technology. I want you to sing praises for membrane cell because it’s truly extraordinary in many ways. The science and technology of membrane cell arose out of a space program in America. A type of membrane which allows sodium to go through and kicks out chloride so that you get caustic soda all the way up to strength well above 32% with no chlorine. So, you call it rayon grade. The concern over environmental problems associated with mercury cell plants initiated a revival of interest in the membrane-cell technology. Initial problems associated with membrane cells were steadily being alleviated in the early 1970s. The development of metal anodes negated problems associated with graphite anode erosion. The importance of fuel cells for the chlorine industry is known. Now we have caustic chlorine plants with the internal fuel cell. Electricity consumption is the key parameter to measure the competitiveness of a chlorine plant, being electricity up to 60% of the variable production costs. With the most up to date electrolysis technologies, the electricity consumption can be considered close to the thermodynamic limit, leaving only a small space for further power savings. The two possible breakthrough toward the reduction of power consumption for the electrolysis are both related to the use of the hydrogen available in the plant. A fuel cell system that is completely embedded into the electrolysis process, installed inside or close to the cell room, built in full compliance with the safety regulations and with customers technical standards, with a balanced trade-off between the maximum system simplification and its safe performances. Other approaches are possible, such as the installation of fuel cells running on purified hydrogen form the chlorine plant. All these process developments are related to the title of sustainability but it has now become fashionable these days to talk but green chemistry. The sustainable part has been the integral part of chemical industry from the very beginning. Example of caustic soda, nitric acid, ammonia clearly show how process problems solving leads to more greener, cheaper and sustainable environment. Prof. Sharma predicted that the most dramatic change in coming years is going to be that you will see most petroleum refineries will turn around and go from fuels predominantly to petrochemicals because fuel consumption will keep on coming down thanks to more efficient cars and electric vehicles. Now, this is what we call a revolutionary change that is going to come and therefore unlike earlier days, all refineries are now talking about going petrochemical. The birth of chemical industry is related with the textile industry. Reverse osmosis has become a household name. How it has been made possible? Because you could make hollow fibre, and hollow fibre was the gift from textiles. Textile industry is the mother industry. We are at a very advanced state globally of researchers approving a new stable catalyst capable of synthesizing methanol at low pressures using only hydrogen and carbon dioxide. This will change entirely the method of making methanol and making ammonia. All this is something very good that will happen. Methanol is processed in huge factories at very high pressures using hydrogen, carbon dioxide and carbon monoxide from natural gas. There is a need for materials than can make methanol from clean sources under low-pressure conditions, while generating low amounts of carbon monoxide. The goal is a process that can be scaled up to the industrial level while remaining nonpolluting and carbon neutral. Imagine if you could synthesize methanol using hydrogen from renewable sources, such as water split by sunlight, and carbon dioxide captured from power plants and other traditional industrial smokestacks. Eventually we would also like to make higher alcohols, such as ethanol and propanol, which, unlike methanol, can be directly added to gasoline today. Professor Man Mohan Sharma obtained Bachelor of Chemical Engineering (1958) from UDCT (ICT) and subsequently MSc (Tech) in 1960. He obtained PhD (Chemical Engineering) (1964) at Cambridge University with PV Danckwerts. In 1964, he returned to India as Professor at the University of Bombay, and later became Director of the University Department of Chemical Technology (UDCT), now ICT (Institute of Chemical Technology – A Deemed University). He remained as Professor for 33 years at UDCT, along with 8 years as Director of this Institute. He has been honored by several universities including IITs by honorary doctorates. 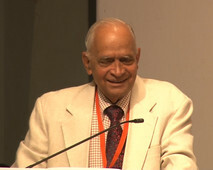 Professor Sharma made contributions to chemical engineering science and technology. His research interests include: Heterogeneous gas-solid-liquid reactions, Phase transfer and Solid catalysis, He has contributed extensively on the role of microphases in multiple reactions which he pioneered. He also became an independent Editor of Chemical Engineering Science at a young age. Prof MM Sharma’s Research Tree presented on June 9, 2017 – at a function held at the ICT to celebrate his 80th birthday – mentions that he has guided 71 PhDs. These PhDs have guided 450 in turn 400 and in turn 50 totaling close to 1000 students. Professor Sharma is a recipient of a number of prestigious academic honours and awards including the 1977 Moulton Medal of the Institution of Chemical Engineers. He won the Leverhulme Medal of the Royal Society for his work on “the dynamics of multi-phase chemical reactions in industrial processes”. Prof Sharma became the first engineering scientist from India to be honoured with Fellowship of Royal Society (FRS) in 1990. This is considered to be one of the highest honours after the Nobel Prize. He was awarded the Padma Vibhushan (2001), and Padma Bhushan (1987) by the President of India. He was INSA President (1989-90). Founded on October 1, 1933, Institute of Chemical Technology, earlier known as University Department of Chemical Technology (UDCT), is India’s premier teaching and research institute exclusively focussed on the chemical and allied industries. Declared as a Deemed-to-be University on September 12, 2008 by the Ministry of Human Resource Development, it was granted Elite Status and Centre of Excellence by the Maharashtra government in recognition of its stellar performance on part with institutes of national eminence in April 2012. ICT has been growing by leaps and bounds and has received many accolades. It is rated as the top-ranking institute under NAAC with an exceptional score of 3.77 and an A++ grade. The most recent laurels of ICT include its expansion with one new campus in Jalna, near Aurangabad, supported by the Government of Maharashtra with a grant of ~Rs. 400-crores, and another campus at Bhubaneshwar (Odisha) supported by Indian Oil Corporation Ltd, with a grant of Rs. 500-crores. 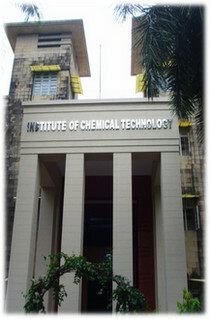 ICT conducts nine Under-Graduate programmes in Chemical Engineering; six branches of Chemical Technology (Dyestuff Technology; Fibres & Textiles Processing Technology; Food Engineering and Technology; Oils, Oleochemicals & Surfactants Technology; Pharmaceutical Sciences & Technology; and Polymer & Surface Engineering), and Pharmacy. In addition, it conducts 18 Post-Graduate and 29 Ph.D. programmes, amongst others. At the two new campuses ICT runs five-year Integrated M.Tech. programme with a unique model where the student spends alternate semesters in industry to gain handson training. An Executive M.Tech. degree is also a unique programme at the new campuses. The faculty is highly accomplished, with multi-disciplinary interests and decorated with national and international awards and honours. ICT has a glorious history, having produced many industrialists, academics, bureaucrats, Padma awardees, secretaries to Government Departments, directors of CSIR labs and over 500 first generation entrepreneurs. The UAA was founded in 1989 with the idea of connecting alumni with their alma mater. UAA now has more than 6,400 members nine Chapters in India (at Ahmedabad, Ankleshwar, Aurangabad, Delhi-NCR Region, Hyderabad, Kolhapur Region, Pune, Tarapur and Vapi); and in China, Singapore, Thailand, UK and USA (in Atlanta and Houston). The Objectives of UAA are to foster fellowship and provide a forum to bring together alumni for their progress; Provide opportunities to alumni, students, teachers and nonteaching staff of ICT for academic and professional advancement; Help alumni contribute to development of ICT and society at large; and promote education and employment enhancing skills at ICT. Management of UAA is vested in a honorary Board of Governors (BOG) that gets renewed every two years. The UAA has an Advisory Council comprising very senior alumni and Past Presidents. Although the UAA is an independent body, it works in close liaison with ICT and its management.